In March and May of 2008 FIU, Miami-Dade and Palm Beach County Emergency Management conducted two real-time joint exercises using the BCIN system with private sector participants. Participants logged into the system in both pre-storm and post-storm scenarios and were asked to assess the information available and determine the situational value and resource capacity. The feedback obtained from these events were incorporated into the current release of the system. In August and September of 2008, BCIN was activated for hurricanes Fay, Gustav, and Ike. FIU participated at Miami-Dade County Emergency Operations Center’s Business and Industry Recovery Desk by demonstrating the BCIN system and receiving feedback from emergency managers on how the system captured and shared reports to the community. Through the fall of 2008, FIU participated in the development of the Standard Operating Procedures (SOPs) for the Business and Industry Program for both Miami-Dade and Palm Beach County Emergency Management. The SOP provides the mission, function, and procedures for operations of each Center’s Business and Industry Recovery Desk, including identification of what information is needed by the business community and the means by which the Desk can identify, vet, and release such information. 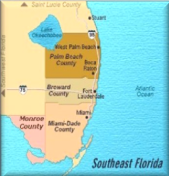 In cooperation with Miami-Dade, Broward, Palm-Beach, and Monroe County Emergency Management Offices, BCIN will be expanded to 10,000 companies by July 2010. During this period, we will engage professional and trade associations and other business communities to enter the network, thus including network participants representing both large and small businesses and a cross-section of industries. Working with our public and private sector partners, FIU is pursuing funding opportunities to allow BCIN to expand to large urban regions (like Tampa, Orlando, and Jacksonville) within the State of Florida. Nationally, we are interested in working with organizations involved with business recovery in large at-risk communities along the Gulf of Mexico, the Atlantic seaboard, and the mid-west. If you represent an organization in one of these areas, we would be very interested to speak with you about our Program.